Our abstract on ‘A prediction framework of functional from structural connectomes reveals relationships between NODDI and tensor-based micro-structural indices’ is accepted for an oral presentation at the Symposium on Big Data Initiatives for Connectomics Research. The presentation can be found here. Our abstract on ‘NODDI and Tensor-based Microstructural Indices as Predictors of Functional Connectivity’ has been accepted as an oral presentation at the British Chapter ISMRM 2015. Dr Fani Deligianni is a research associate at the Developmental Imaging and Biophysics Section, UCL Institute of Child Health. 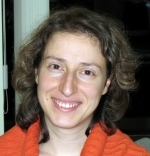 Her research interests lie within medical image computing, neuroimage analysis and neuroscience. She develops sophisticate computational approaches in machine learning, statistics and network analysis for the investigation of human brain structure and function. In 2008, she was awarded an MRC Special Research Training Fellowship in Biomedical Informatics to explore links between structural connectivity as it is measured with Diffusion Weighted Imaging (DWI) and functional brain connectivity captured with resting-state (rs)-fMRI. She was based at the Biomedical Image Analysis group in Computing Department of Imperial College London. Her research work suggests a prediction framework to study the link between structural brain connectivity and functional brain connectivity. She is also an affiliated member of the Centre for Brain and Cognitive Development (CBCD) at Birkbeck. She worked at CBCD from 2006 to 2008 and she developed a toolbox for contingent eyetracking, Talk2Tobii, to investigate the development of social skills in toddlers. The toolbox is used in several labs and is now integrated in T2T Package and SMART-T. Her PhD work was on augmenting 3D reconstructed models of the bronchial tree with 2D video images acquired during bronchoscopy. Bronchial deformation was modeled based on Active Shape Models (ASM) and a predictive tracking algorithm was incorporated to improve tracking of the endoscopic camera. Her track record includes over 30 peer-reviewed publications (11 journals) in high impact factor journals such as IEEE Transactions in Medical Imaging (IEEE Trans Med Imaging) and internationally recognised conferences, such as Information Processing in Medical Imaging (IPMI), Medical Image Computing and Computer Assisted Intervention (MICCAI) and IEEE International Symposium on Biomedical Imaging (ISBI). She was a program committee member of the MICCAI workshop on CDMRI 2012 and CDMRI 2013 and she was invited to chair one of the MICCAI-MBIA13 sessions. She holds a PhD in Medical Image Computing at ICL (2002-2006), an MSc in Advanced Computing (awarded project distinction) at ICL (2001-2002), an MSc in Neuroscience at UCL (awarded project distinction) (2008-2010) and a BSc in Electrical and Computer Engineering at Aristotle University (1995-2000), Greece. Page generated 2015-08-30 17:25:06 BST, by jemdoc.